(l-r) Jeff Heilig, Asst. Principal, Chris Apodaca, VP Board of Education, Ricardo Brown, Principal, Dr. Mary Sieu, Superintendent, teachers Amanda Silvas, Claudia Serrano and Jimmy Brink. 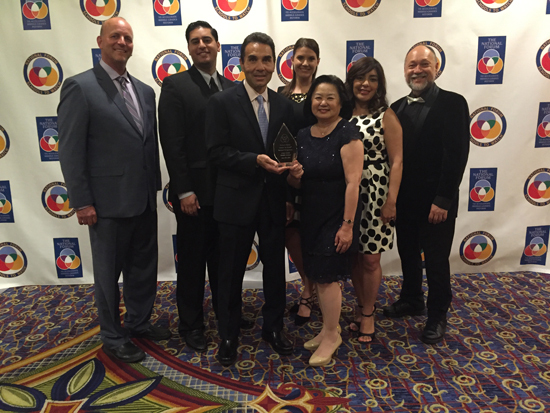 On June 23, 2016, Ross MS was honored at the 12th Annual Schools to Watch Award Celebration sponsored by the National Forum to Accelerate Middle Grades Reform. Ross Middle School is located in the city of Artesia and serves 7th and 8th grade students in the ABC Unified School District. The National Forum held in Washington, DC recognized Ross MS as one of 13 middle schools in California for the national recognition as well as 144 schools from throughout the country. The National Forum uses a competitive, rigorous review process to identify high performing, high impact middle schools so that all middle schools may have models of real-world success. The National Forum vision is to prepare students to be lifelong learners ready for college, career and citizenship. Ross MS met the criteria of being a middle school that is academically excellent, responsive to the developmental needs and interests of young adolescents and socially equitable. Attending the Awards Celebration were Vice-President of the Board Chris Apodaca, Superintendent of ABCUSD, Dr. Mary Sieu, Ross MS Principal Ricardo Brown, Assistant Principal Jeff Heilig, Teachers Amanda Silvas, Claudia Serrano, and Jimmy Brink. Superintendent of ABC Unified School District, Dr. Mary Sieu shared that Ross Academy Middle School is now the fourth middle school in the District to be selected as a School to Watch by the National Forum. Carmenita MS, Tetzlaff MS and Fedde MS received the designation during the past three years.